We gather, gab, nosh and fête frequently. The backyard sisters take our celebrations seriously. Yes,truly, getting the extended family together and feasting are not activities to be trifled with. it tastes luscious. 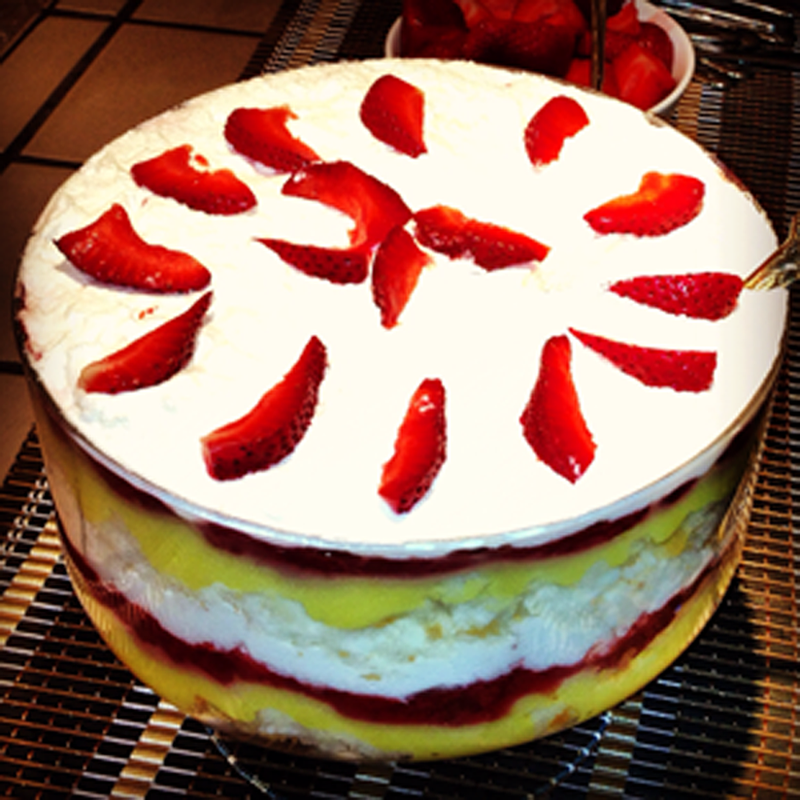 Now I know why he loves it so; it is a perfect mix of sweet, fruity flavors and creamy, airy textures. It sure impressed this guest and I daresay it would impress yours too, and that’s no trifling matter! A trifle dish is the optimum container but if you don’t have one don’t let that stop you, any tall glass bowl or tall glass individual dishes can work also. 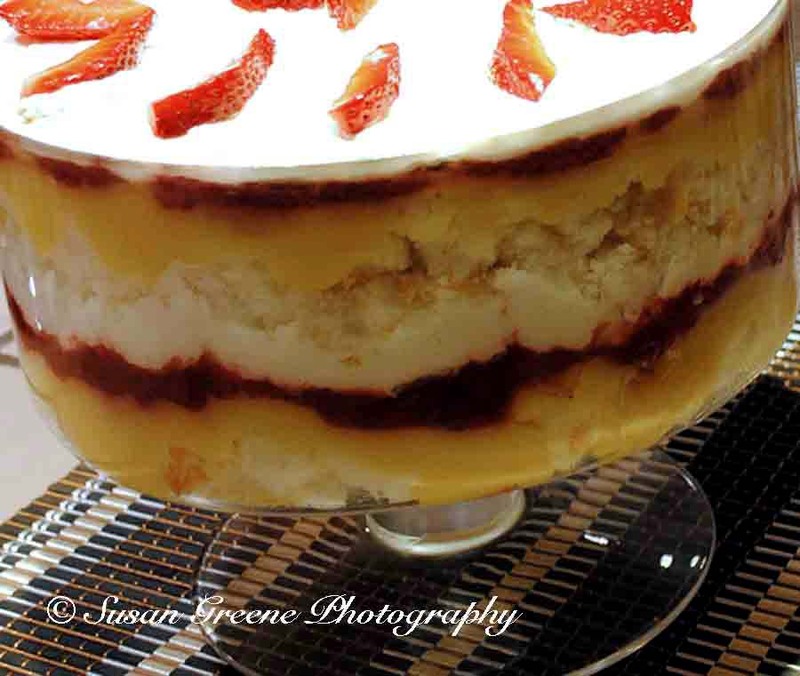 Begin with a layer of the angel food cake, then spoon pudding over, next the strawberry sauce and then repeat topping it with whipped cream and sliced fresh strawberries. Mix sugar, flour and salt in a saucepan. Mix milk and egg yolks together and add to dry ingredients. Cook over low to medium heat until thickened stirring constantly. Remove from heat and add vanilla. Cool and chill. Combine mashed strawberries sugar, cornstarch and water in a saucepan. Cook until thickened stirring frequently. Remove from heat and add butter and vanilla and stir until butter incorporated. Cool. To a pint of whipping cream add either powdered sugar or agave and vanilla to taste. Then whip with an electric mixer on high speed until it holds its own shape. If you beat too long you will end up with butter. Molasses Crinkles are another one of the cookies which make an appearance on the Big Platter. The cookbook containing the original recipe is one the Backyard Sisters have turned to many times over the years. and the spices cinnamon, cloves and ginger. Whatever it was, once mixed and baked, they have beckoned with their spicy aroma. Spices which boast health benefits by the way, and can evoke feelings of comfort and joy. So, bake a batch and watch them disappear. Mix dry ingredients into butter mixture until blended well. Chill dough in refrigerator for at least 2 hours or overnight. Roll teaspoonfuls of chilled dough into balls the size of large walnuts. Dip the tops in granulated sugar. Place the cookies, sugar side up on a lightly greased or parchment paper covered cookie sheet, 3 inches apart. Bake 10 minutes or just until set but not hard. Or bake some and share with friends and family. A fig. A failure. A long wait. Brevity: (Somewhat) Daily News from the World of Literary Nonfiction.